The Holy Nobleborn Empress of Gruzia (Georgia) Tamara the Great was born in about the year 1165. She was descended from the ancient Gruzian Bagratid dynasty and with the year 1178 she was a co-regent with her father, George III. 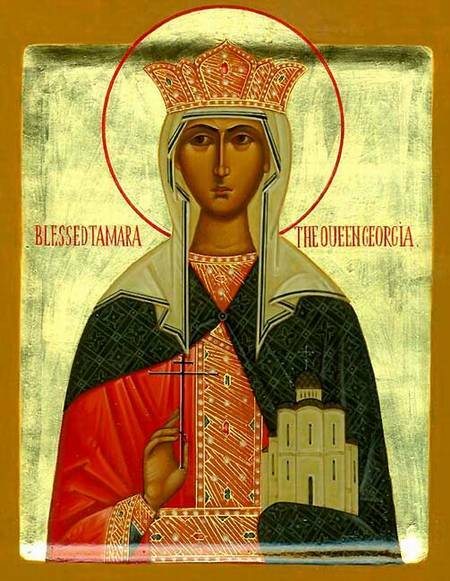 The period of the reign of Saint Tamara is known as the Golden Age of Gruzian history: the Empress Tamara was noted for her lofty piety and, continuing the initiatives of her grandfather, the holy Nobleborn Emperor Saint David III the Restorer, she promoted the wide dispersion of the faith in Christ throughout Gruzia, amidst the construction of churches and monasteries. In 1204 the governor of the Ruma sultanate, Rukn-en-Din, dispatched a demand to the Empress Tamara that Gruzia renounce Christianity and accept Islam. The Empress Tamara refused this demand, and in an historic battle near Basiani the Georgian army defeated a coalition of Moslem rulers. The wise rule of the Empress Tamara gained her the love of all her nation. The final years of her life she spent in the Bardzia Cave monastery. the nobleborn empress had a cell, joined together with the church by a window, through which she could offer up prayer to God during the time of Divine-services. She died peacefully in the year 1213, and was enumerated to the rank of the Saints.